This is quite simply one of our best new products in recent years. It is not a fibre optic unit but two very effective LED light units mounted on goose neck flexible arms. 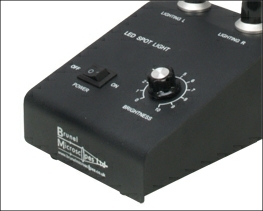 The light output is outstanding and would match a 150 watt fibre optic unit at full capacity for a fraction of the price. 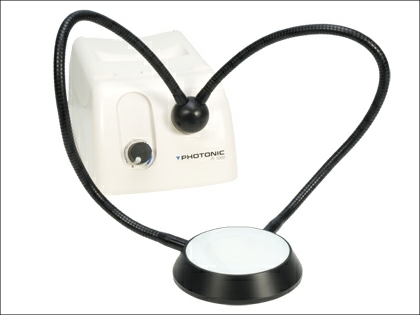 Finished in black enamel the metal alloy base is very stable and has an on/off switch with full rheostat control. The flexible arms have good rigidity and maintain position well. 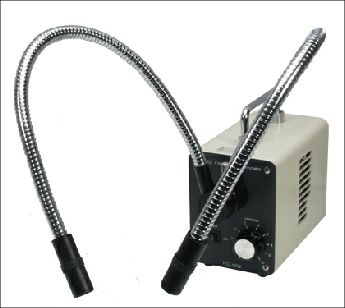 As with all LED units the heat gain is minimal and therefore ideal for heat sensitive specimens such as insects. This lighting system is highly recommended. 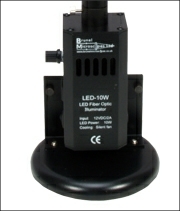 This has to be one of the best value for money stand alone cold light sources available. LED lighting has revolutionised cold light source units and this particular product is without doubt the market leader when it comes to cooling fan noise. It is quiet, so quiet that on occasion it is difficult to know when the unit is running. The light guides locate firmly in the base unit and are held in place by a unique flange system that prevents rotation of the arms when they are locked in place. The on/off switch and rheostat control are situated on the front panel and the unit has a fold flat carrying handle on the roof of the power pack. Because the unit is LED light based the traditional method of comparing units by wattage output no longer applies. However the output of this unit in our opinion surpasses that of a traditional 150 watt unit. 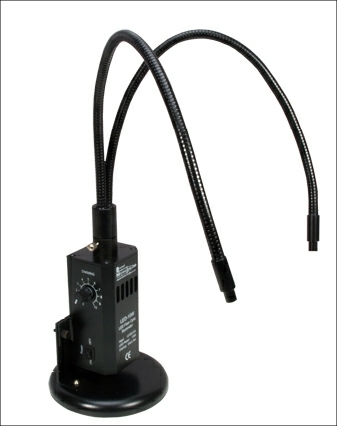 As with all LED units the heat gain is minimal and therefore ideal for heat sensitive specimens such as insects. 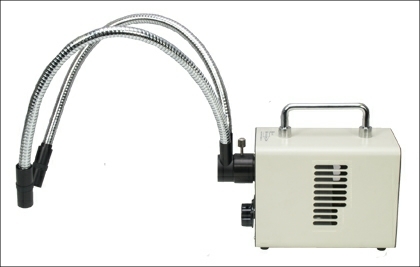 The Photonic range of cold light fibre optic units are of Austrian manufacture with a contemporary design. The range represents excellent quality and is available in a specification and price range to suit all budgets. The light source is available in 30, 100 and 150 watt units, all have variable light intensity control and can accommodate side filter insertion. The goose neck guides are in single or double leg versions and are 550mm in length. The units have particularly low noise levels and have a very easy bulb change system. 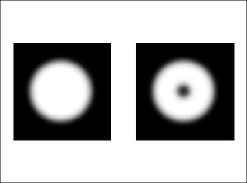 The unique Photonic optical component eliminates the dark centre of the light cone, which is often a feature of other makes. This increases the light intensity by up to 40%. 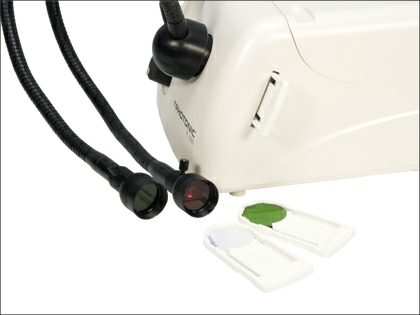 In addition to the filters which can be inserted into the light source unit each gooseneck arm can be equipped with individual coloured filters and a focusing lens. 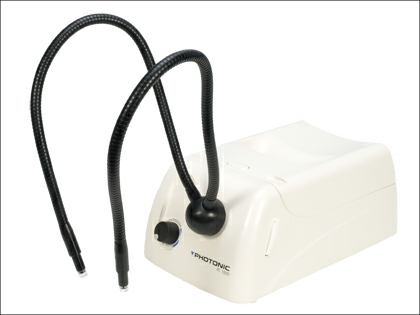 The Photonic units also have fibre optic ring light units that can be attached to stereomicroscope heads for vertical all round illumination. We have adapters to enable the ring lights to fit most of the popular stereo brands.The ring lights can be equipped with fluorescence and polarising filters. Each Photonic power unit weighs 1.3kg and measures 268mm x 168mm x 120mm. 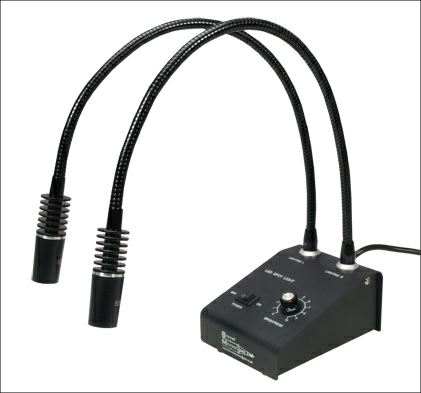 A genuine fibre optic system with a powerful 10 watt LED light unit delivering dual spot lights via two goose neck fibre optic arms. 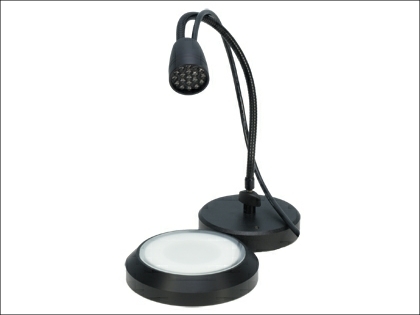 The unit is shown here attached to its circular heavy duty base that provides excellent stability as a stand alone unit. However the unit comes complete with a simple adapter that will allow the power box and goose necks to be attached to the upright of most stereo pole stands. This allows the fibre feeds to be positioned to give optimal illumination for the specimen being examined without the support base ‘getting in the way’. The unit has an excellent fan cooling system and a rheostat brightness control.